Conflating the miraculous with notions of chance and arbitrariness, Sheilah Wilson’s work alludes to religious motifs from a perspective of a sincere and heartbroken skeptic. It often centers around the empty center, an impossibility that she bravely faces while connecting history, land and personal experience into fluid and surprising actions within her artistic practice. I met Sheilah Wilson while teaching at Denison University in the Fall 2012 when I attended a lecture she gave on her recent project, The Invisible Inside the Visible, commissioned for the W(here) Festival. In this project, Wilson searches for a racetrack lost in the land of Nova Scotia by soliciting drawings of maps and verbal testimonies from the rural community of River John, her home town. Wilson’s work often incorporates numerous mediums, such as video, photography, drawing, performance and public art, into one continuous narrative arch. 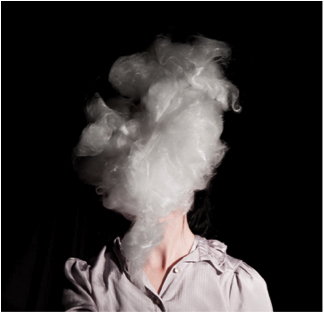 Sheilah Wilson earned a BA at Mount Allison University in English and French (1999), a BFA in Photography at NSCAD University (2002) and MFA Studio Arts at Goldsmiths College (2004). 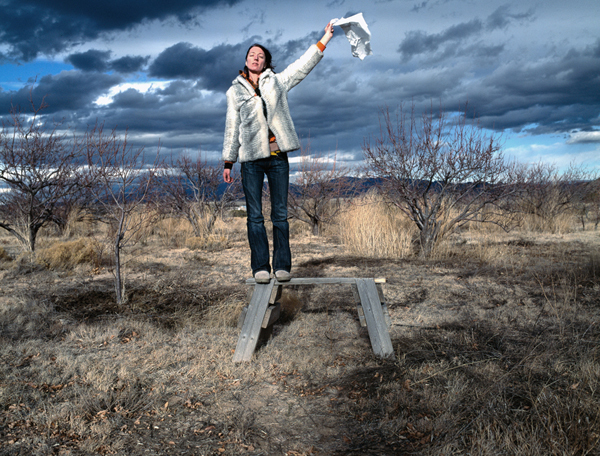 Wilson has exhibited her work in Canada, England, New Zealand, Israel and the United States. Awards include CBC Aural Recall winner (2002), Nova Scotia Talent Trust recipient (2004), Creative Capital Foundation Scholarship (2007), Canada Council Travel Grant (2008), Denison University Research Funding (2010), Banff Center thematic residency scholarship with Adam Chodzko (2011) and Canada Council Project Grant (2012). Wilson is currently an Assistant Professor of Photography at Denison University. A catalog from Wilson’s recent solo show If Becoming This is now available from Antioch University Press. The following conversation was recorded in Sheilah Wilson’s home in Granville, Ohio on December 7, 2012. "You are you are my favorite photograph" 2010. Duratrans and light box. 20" x 24"
Leeza Meksin: I wanted to ask you a bit about your background, your childhood. Where did you grow up? Sheilah Wilson: I grew up in Caribou River, Nova Scotia, a pretty rural area. Nova Scotia is one of the more impoverished provinces of Canada and I think that the geography of the place really impacted me–but also the socio-economics influenced me as well. On top of that, there’s kind of woven into the beauty of the land, the harshness of it. There’s also a story of how my parents ended up there, which was that they emigrated from the states in the 1970’s because my dad wanted to build wooden boats. So there’s almost a utopianism in terms of how they even ended up in this place. LM: Did your dad get to build boats there? SW: For about a year. And then boat building changed from building wooden boats to fiberglass. So even how we ended up there seems sort of like a dream. Like, Really? People made decisions like that? But it was at the time when there was a lot of back-to-the-landers and people that moved back to Nova Scotia, so there was a community of people who existed there and hadn’t grown up there. And that was something that I struggled with that maybe informed my feeling of always being on the outside of things… like even though I was born in that town I was still considered to be from away, a foreigner. LM: Did you stay in Nova Scotia for college? SW: Close by, in New Brunswick. A university can be its own separate universe and show you that other things are possible in the world, so it did that for me. 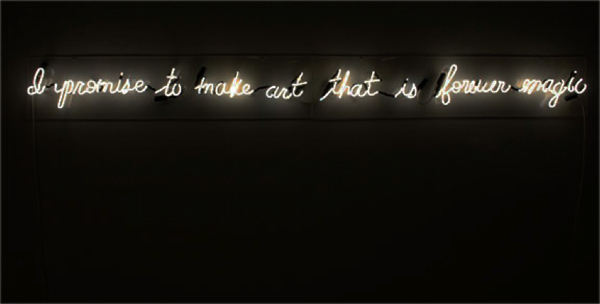 LM: What made you want to be an artist? Was there a pivotal moment or a series of events? SW: I don’t know. I never thought of it as what it was. But I think maybe growing up in the country and feeling isolated in certain ways, I tended to escape to an imaginary place and maybe art making was the closest I could ever come to getting back to that imaginary place where you can create your own kingdom. LM: That makes me think how many of your projects seek contact with other people, through ads you place in newspapers, etc. This seems to be a defining thing in your practice amidst the very different types of things you do in terms of media. SW: There’s always a desire to touch something or to interact with a place or a space, to put a bend in something. In terms of the work where I’m asking people to interact with me, and in the work that I do where I ask people to contribute or respond, it rarely is what I think it will be. And that’s the beauty of it–that something strange happens. (left) "Fear Collector" 2004. Advertisement in paper. (right) Cloud solicitation ad in newspaper, 2011. LM: So, there’s an element of surprise. You set up the parameters but then let something new come back to you. It reminds me a little bit of Ms. Lonelyhearts, the newspaper columnist soliciting and responding to people’s darkest moments–the profound loneliness that these letters reveal. It makes me wonder if there are elements of mysticism and martyrdom in your work? SW: I’m so selfishly fulfilled by the contact I have with people that it’s hard for me to see martyrdom in it. Sometimes you have to create a project or a structure in order to have the contact you otherwise wouldn’t have. It gives you a reason and a way in to interacting with people. I create a structure and then things happen that you don’t anticipate. Also, I often take what people give me and based on that. I re-tell their stories. So, I don’t feel like I’m burdened by, or have to respond to the information that I get from people, and a lot of times it’s anonymous. I don’t feel like I have to fix anything. In fact, even in the case of the race track in River John, I met with those people, I got their stories, and the drawings of the maps. I handed out the newspapers I made to all the people who participated and had them available at the gas station. And, I’m sure that many in the community of River John may have wondered what all of it was about. I don’t feel like I have some kind of a responsibility to make it accessible for everyone. I’m really most curious about how if we can put enough pressure on something historic or geographic, something new emerges; something morphs out of the old story. (left) "The Invisible Inside the Visible" 2012. Installation view of newspaper available at local gas station. (right) Delivering "The Invisible Inside the Visible" to mailboxes on Cape John Road, River John, 2012. LM: You’ve called yourself an ethnographer before. Is this a sincere desire to transcribe peoples’ histories and memories, or is it more of a satire? SW: I feel like the work could never happen unless it was first an interaction between me and somebody else. That’s really crucial for it to even become. So many words seem desirable…like magic or ethnography, but I also recognize the absurdity of my quest at the same time. The ethnography that I’m doing is probably not true ethnography, but I don’t care. I’m more interested in the new kind of translation that can come out of it and that happens by taking these things that are somewhat recognizable like the idea of ethnography, gathering information from people–but the output that’s generated doesn’t have to fit within those confines. "Courage" 2001. 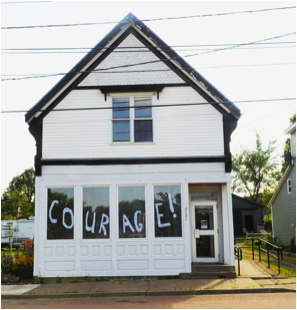 Installation in storefront in River John, Nova Scotia. LM: Maybe it’s the element of the absurd that brings out the surprising aspects of each project. People who have no frame of reference for what you’re doing may be attracted to it for that very reason. It’s almost like you’re enacting a tender, but underwhelming magical moment for them. And from the very start it’s a mirage, a quixotic quest for a connection or a miracle. I’m wondering if you see a missionary role for the artist to bring a bit of awareness of the liminal into the banal reality? SW: Definitely the absurd has importance, and how it is woven into the everyday. It might be missionary, but missionary of a strange, trickster religion based on revealing the sad, funny and strange underbelly of our world. "Memory Translation Machine" 2011. Inkjet print. 24” x 24"
It’s more like you see the thing and you want to put a tear in the way that we see things–wanting to infiltrate that in some ways and something slips for a second–or how laughter arises when there’s incomprehension of two worlds coexisting together, so you have to laugh to reconcile that. There’s an intake of breath; things stop, things fall apart. I like when we don’t recognize something for a second and figuring out how I can make that happen in the world in small ways. LM: Is your practice a quest for believing, or an exploration of a belief that you already have? SW: No, I think I don’t believe. It’s always setting something up to make myself believe. Even though I know I will likely fail. LM: That’s what gives the work such a wistful quality, on the outside, but the more you get into the imagery and the content the darker, or sadder, it becomes. I see this especially in the Flight Series. How did you choose the settings? SW: First, I just thought of them as funny, as these absurd attempts. Within the absurd, there lies humor and discomfort, but also sadness. The work was made when I was in New Mexico, and I realize now that it was a desire to imprint myself onto that land. It was this vast desert landscape unlike anything I’d ever experienced before and so quintessential somehow. And I thought how do you get into this? How do you make it yours? LM: It’s interesting that they are of New Mexico because when I saw them at Antioch I thought they were taken in Nova Scotia. There’s a northern light and a brooding sense of place that reminds me of a vast northern steppe. Was it purposeful to evoke Nova Scotia in these portraits? SW: I think it just came out. We are all struggling for that place we call home. How we define ourselves is very much how we define ourselves to the place where we grew up, and that in relation to the place where we are now. I felt that I was having a conversation between two geographies, which stood in for other conversations as well. LM: This makes me think of your most recent project, The Invisible Inside the Visible, which you did this past summer in River John, Nova Scotia. Could you talk a little bit about it? SW: Yeah, the Invisible Inside the Visible was conceived a few years earlier when someone mentioned to me the racetrack that used to exist in River John. I went out for two summers and looked for it with different people who thought they could help me find it, but we couldn’t find it. It was already legendary, and got further mythologized in my mind through these vain attempts to locate it. And then when I was invited to be part of this project organized by Mary MacDonald, I decided to see if I could find it for real. I also saw it as an excuse to knock on the doors of people who live along this road, where I also have a house, and ask them about this racetrack. Drawn map of how to find racetrack in River John, 2012. LM: So you would knock on their doors and say what? SW: I knew one person whose farm had been on the same area as the racetrack at one point, so I went there first. I asked her to draw me a map, and tell me how to get there. She directed me to other people who she said I would need to ask for advice, and those people directed me to the next person I should talk to. LM: It’s kind of a classic setup for a fairytale. There’s this place or thing that needs to be found for some very important reason you don’t quite know. And the protagonist goes on a quest the success of which lies in finding the right sources and asking the right questions. LM: So this track was a big deal in this town, back in its industrial heyday? SW: Yeah, in the early to mid 20th century, River John was one of three biggest places for shipbuilding. So there was a much larger community there, then. The old timers who hang out at the only gas station now will tell you about how many hotels, grocery stores, hardware stores, etc. that used to be in River John. The racetrack was out in the middle of a pasture and it was a big community event with over a thousand of people showing up. LM: I don’t know much about racetracks, but I understand they are quite large. So not being able to find a big chunk of land is kind of mysterious, no? SW: It is a big chunk of land, but it also became part of the community pasture. This pasture spans at least half of the Cape John peninsula, and anyone from the community can put their cows on this pasture in the summer. So the specificity of where the track is located is less clear because the land set aside for the pasture is vast, but you know it exists somewhere inside that pasture. Putting the hydrated lime line down, 2012. LM: Did you ever doubt that you would find it? You went out there two summers in a row, and could not find it. Why did you go back again? SW: Whenever I engage on any project I understand the deep and enduring relationship my work has with the idea of failure. I was expecting things to fall apart at any moment. It’s always more about the quest and how far it leads you. In this case, my fear was that there was not going to be any mark in the land. It was there in 1920, but now it’s 2012. I wasn’t convinced that there would be anything left. Only one person I talked to had actually seen one of the races and the other people would pretty much end their description of where it was with “Or so they say” or “That’s what I’ve been told.” There was always a caveat. And then I went out with one of the community pasture guys, one of the guys who are hired to watch the cows. We had the maps and we had a rough idea of where to look, and we went out together again to find it. He was a bit dubious about whether or not it really existed. But then we found it! And it was just by touch. We were walking along and stumbled upon a rise in the land, that we followed, feeling it with our feet. LM: And then you came back there once again to make a site-specific drawing that was photographed from above. Can you talk a little bit about that? SW: I wanted to draw the line back to show where the track was because I wanted the project to go back out into the community where I gathered all these stories and I was trying to think of how to do it. I really liked the idea of laying down chalk to make the line because I wanted something that would make a temporary mark, and would be easy to walk with. I so distinctly remember that day ‘cause my mom was helping me with Rose [Sheilah’s daughter]. We were schlepping bags of hydrated lime out to the track and it was far away. We knew the pilot was coming at noontime and everything had to be done before he arrived. 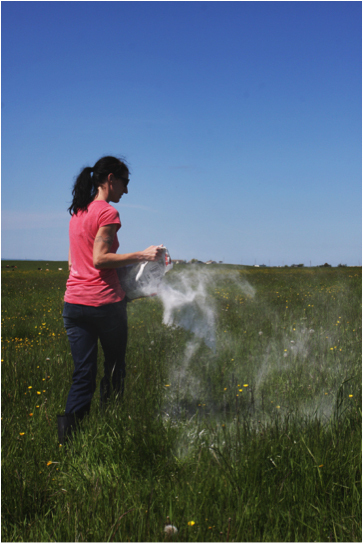 So I’m going around doing this mark in the grass and feeling that I’m running out of chalk so going back and scooping some to shake it over the areas that I think don’t have enough. Just feeling like…in my heart that this can’t possibly be, this can’t possibly reveal very much. At the same time, there was something really nice about having to let go. Because I couldn’t see what I was doing, I had to just give up control. I started to doubt myself, even my own physical relationship to the land. You feel like you’re following this track, but it’s not obvious at all, so you really have to be in-tune with your feet on this slight rise in the land. It’s easy to doubt if you’re in the right place. "The Invisible Inside the Visible" 2012. Hydrated lime in landscape, River John. LM: This part seems most mystical to me. That your almost blind struggle created a perfectly elliptical shape, a massive land drawing, with a scale so out of reach. SW: When I saw that photo I found that moment of belief! 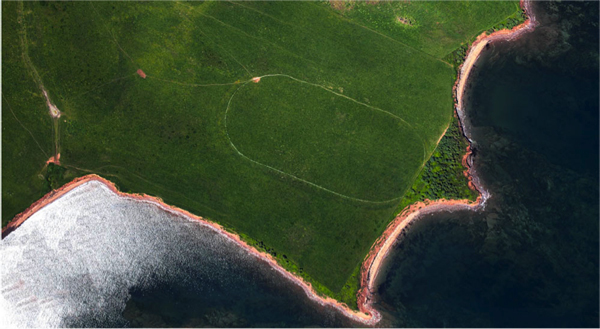 I didn’t expect to see a perfect image of the track etched into the land. LM: The line that the hydrated lime makes is dreamy and cloudy. Makes me think of the variety of marks you’ve accumulated from others. What interests you in the marks made by other people? SW: I’m very interested in the idea of translation through the experience of drawing, a gesture that makes a mark, and how we make these temporal gestures that may yet reveal something else. It’s always a surprise in terms of what you get. Even when I was asking people to draw the maps for the racetrack, I was always so surprised by the diversity of the kind of maps that I got–same thing with the drawings from A Line Drawn Continuously and Without Looking. I ran ads asking for people who had had an out of body experience. They would contact me and when they would come by I’d ask them to do an automatic drawing of their story as they were speaking, without looking. I then took their drawings and I retraced them onto Mylar so I can use it as a negative to create a print, which became the inverse of the actual drawing. 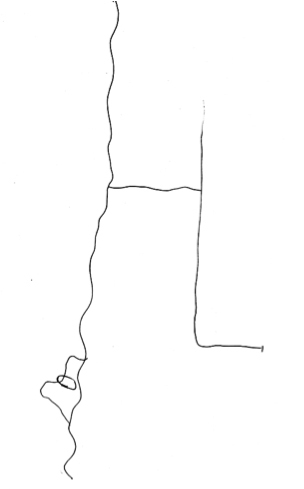 "A Line Drawn Continuously and Without Looking" 2011-12. Fiber print. 20” x 24”Pictured above Leanne (l) and Ruth (r). LM: The drawings are so stark and seem to betray so much about people’s temperaments. The way the body is the vessel bearing a mark and also the psychic or geographic displacement between body and spirit. 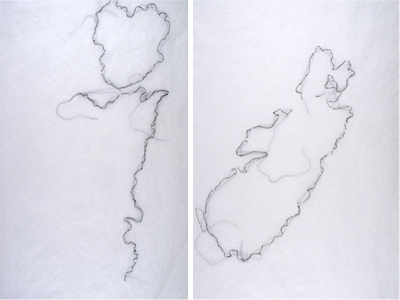 Like in your project of the Nova Scotia map embroidered from memory, you did 26 of these? SW: Yes, there were 26 miners that died in this mining accident in my town. I was in New Mexico [when I made the embroidered drawings] and I think that was part of it. I did it from memory. The Westray tragedy happened when I was 16. There are some things that will always be a part of you. Maybe being in New Mexico allowed a certain distance from the place I was from. It became such a ritual. One winter in New Mexico, I would sit in my rocking chair, looking out my window, and sew these maps of Nova Scotia from memory. LM: You talked about the utopian nature of your father’s move to Canada. Do you think about utopia in your work or in the way you structure your practice? SW: For me utopia, belief, transcendence…they all speak to some kind of religious feeling, which I am in search of. I try to set it up, but it’s always about what happens on the way there. I just have me, this body, to try to get to this place–and I just keep trying. Maybe I’m in love with the failure itself…because the failure is so beautiful. LM: It’s very Kierkegaardian of you. How much redemption there is in failure–not something our culture likes to admit. SW: Ha! Precisely–and using my own flawed body as the vessel. I feel like I perform all my experiences through the body. Using it even though I know I won’t get THERE. LM: Is that the risk? SW: The risk is that I never know what things are gonna look like, especially when I start projects that ask others to participate. I don’t want to know what it will look like. I want there to be this fear. I need to know that I can’t control it. The risk and fear generates a desire to make the work. Each new project leads to something that makes you want to try something else. The only thing you have against the fear is trying toward something. So, for me, the trying is a thing that has to incorporate the accidental and the paranormal, and by paranormal I mean the unexpected. I’m always so curious about how we can get out of ourselves. Even as I sleep on someone’s memory with photo paper, I don’t really believe I’m translating that memory, but I do believe that I do not know what it will look like. LM: The “memories” left diverse traces. Can you talk more about that project? "A month of memories" 2012. 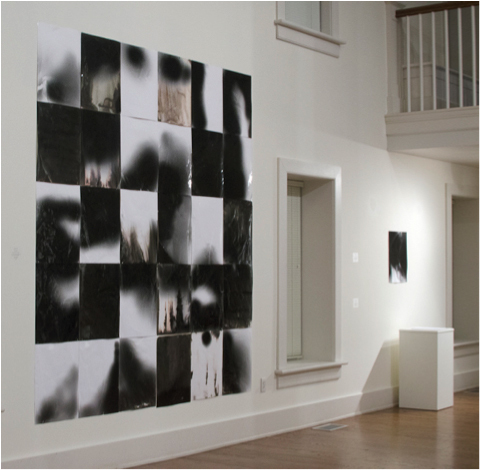 Installation view at Herndon Gallery. SW: I asked people to give me a written descriptions of their favorite photograph and then I slept on it and developed the unexposed photo paper. LM: It’s interesting how you come at all of this as a non-believer, since your projects allude to the occult, witchcraft, mediums, oracles, and how all these traditions touch on gender roles. What is at stake for you in these themes? SW: Maybe myself feeling like I don’t know which world I belong to. These projects give me a chance to operate in between. I look to examples of people who have operated in between worlds; mediums between the living and dead, geography as a place in between belonging, images of self as a way of performing gender and sexuality into a place. Because, I don’t quite belong to a place or a space. And the trying, apparition and disappearance, is the only way forward. Images and video courtesy of the artist. 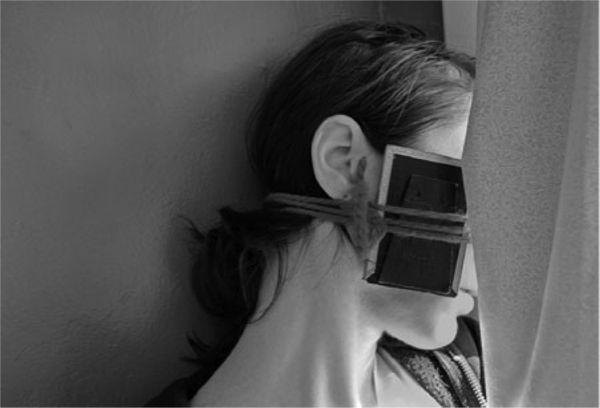 Leeza Meksin is a Brooklyn-based interdisciplinary artist. Born and raised in the Soviet Union, Leeza immigrated to the United States in 1989. She received a BA in Comparative Literature and MA in the Humanities from the University of Chicago in 2000, a BFA from The School of the Art Institute of Chicago in 2005, and MFA in Painting from the Yale School of Art in 2007. Meksin has exhibited her work at Thomas Erben Gallery, NYC; Regina Rex Gallery, Brooklyn; Adds Donna Gallery, Chicago; Cosign Projects, St. Louis; and many other venues.